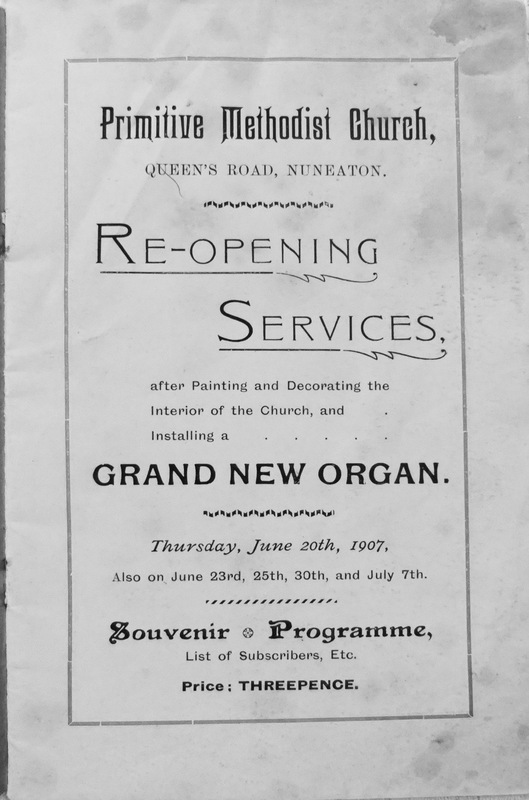 In 1907 the Nuneaton Primitive Methodist Church in Queen’s Road installed a new organ and redecorated the interior of the church. 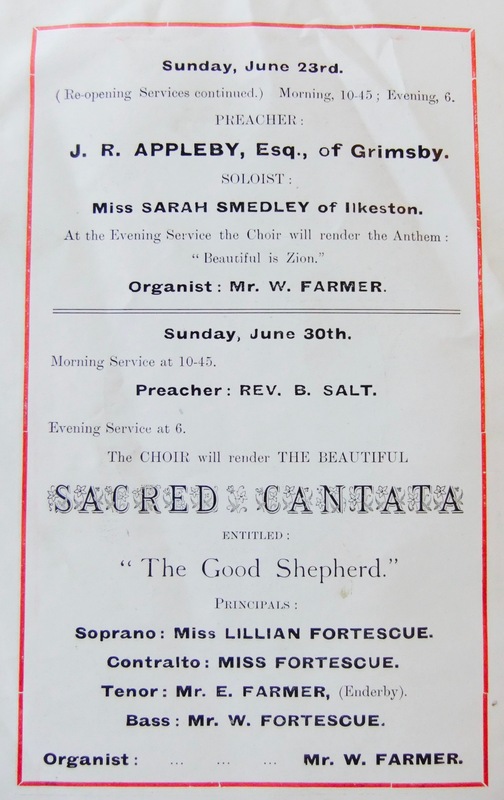 In June/July 1907 the re-opening was celebrated in a series of services and concerts. 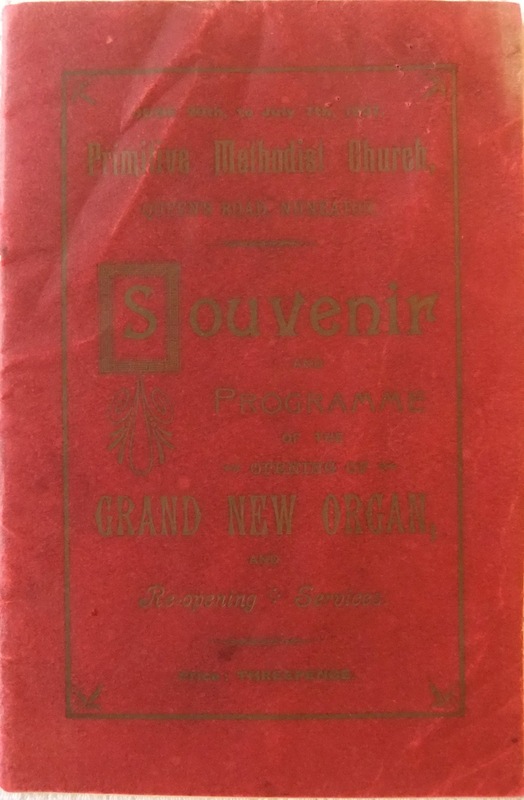 A souvenir booklet was published. 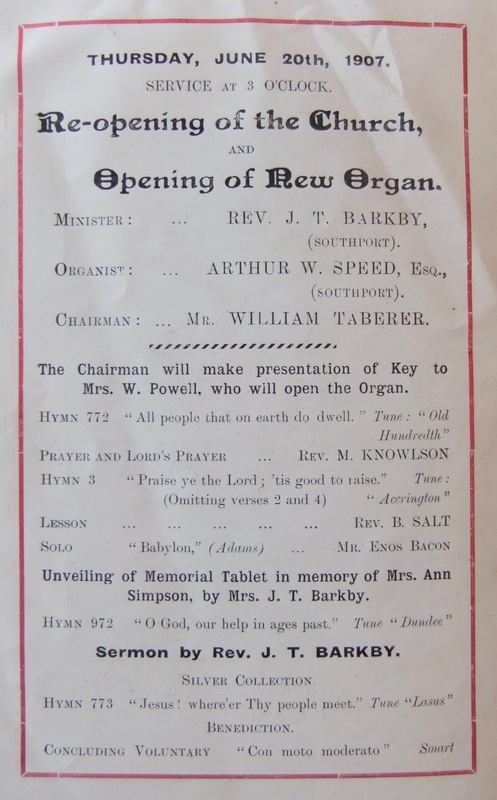 This page comprises pictures from the souvenir brochure and the transcription of a brief history of Primitive Methodism in Nuneaton prepared by the minister, Rev. Benjamin Salt. 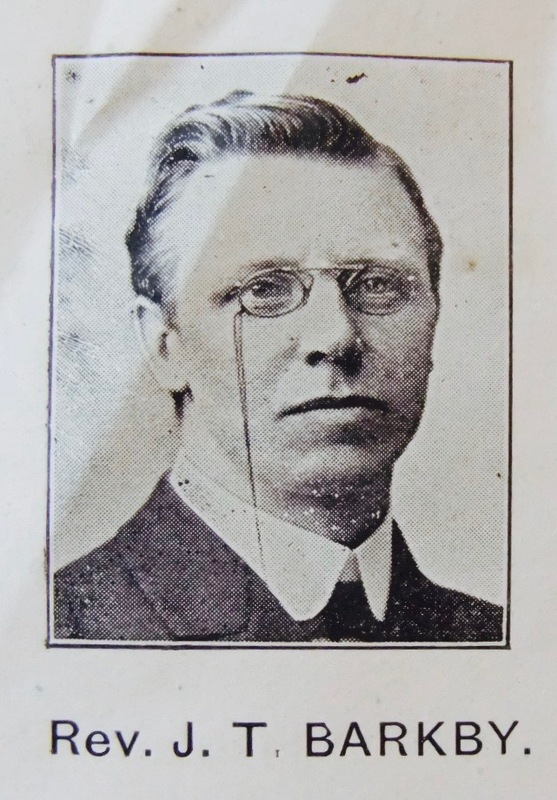 Brief History of Primitive Methodism in Nuneaton. 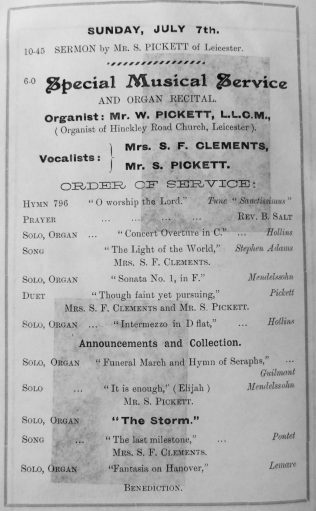 Primitive Methodism in Nuneaton dates back to the time of the accession to the throne of the late Queen Victoria, – 1837. 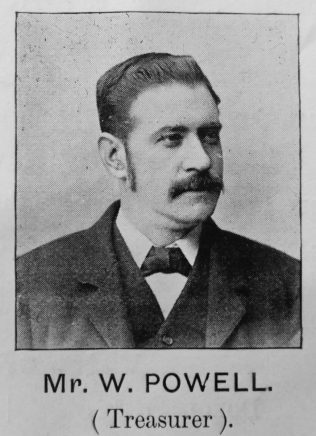 It owes its origin largely to a humble local preacher, – John Page of Barwell, better known as “Daddy Page,“ who missioned the town. 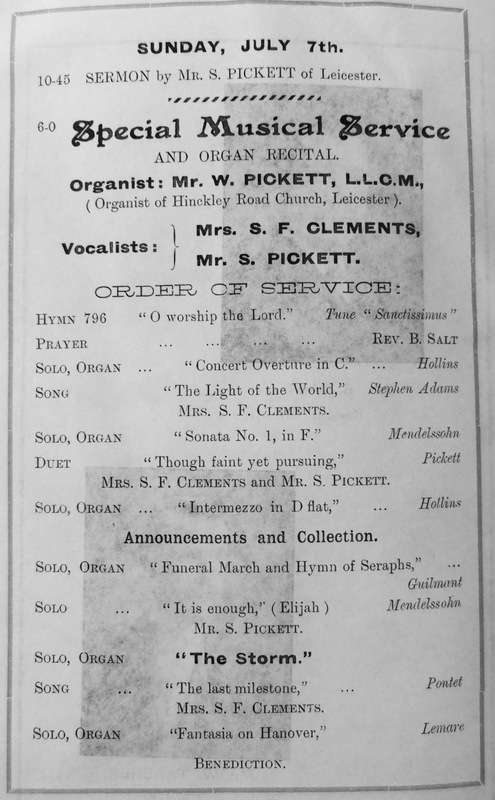 A little Chapel erected for the use of the Arminian Methodists was taken over, and a Society formed, which became a part of Leicester Circuit. 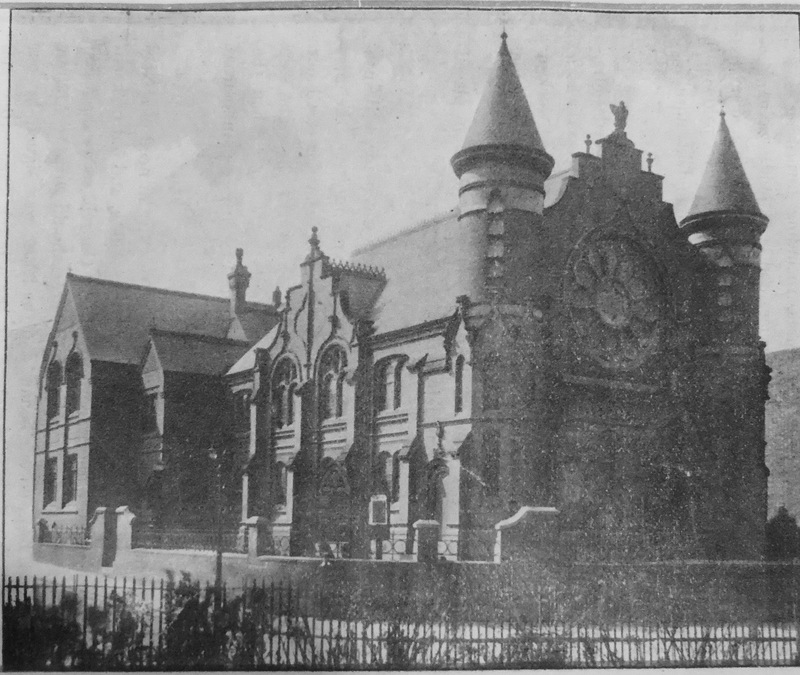 The old Chapel though very small, was too large for the Congregation, so it portion was partitioned off, two dwelling-houses were made of the front part, and let at the handsome rent of one shilling each per week. 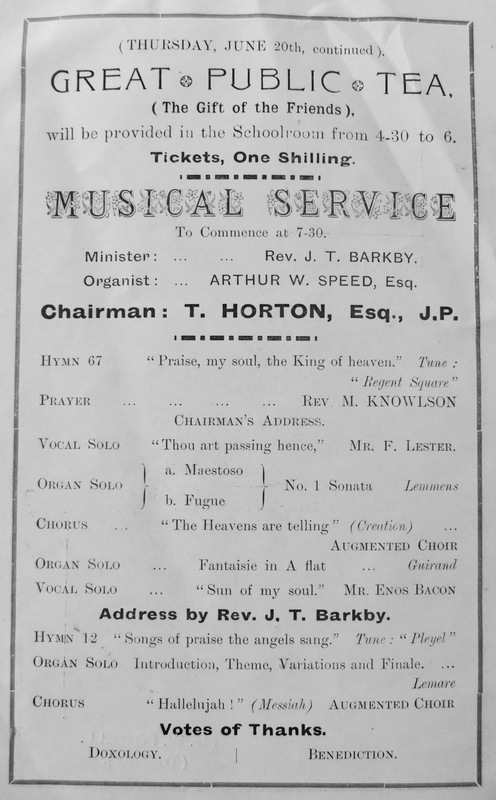 During this part of our history, the honoured founder of our Connexion, – Hugh Bourne, – preached in the little chapel, and made his home with the late Mr. and Mrs. Austin Taberor. 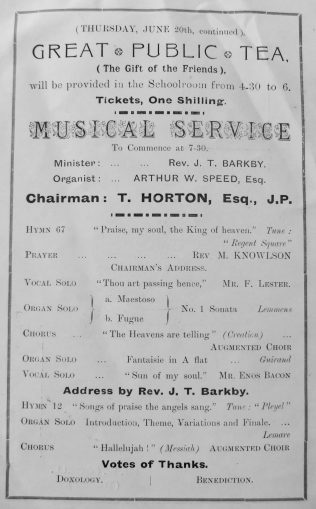 It was on the 8th of July, 1897, that at little band of men and women marched from the old building, (which was situated at the corner of the present Gas Works), singing as they went “We’re marching to Zion,” and the door of the handsome and commodious Church premises was opened by Dr. Broadbent on behalf of Reginald Stanley, Esq., J.P., of this town. 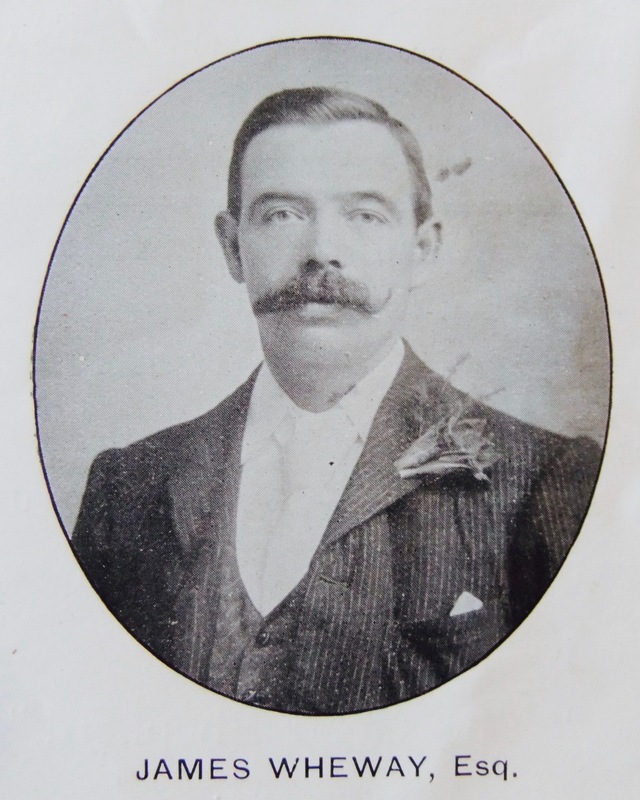 We wish here to acknowledge our indebtedness to Mr. Stanley, who contributed no less than £245 towards the buildings. 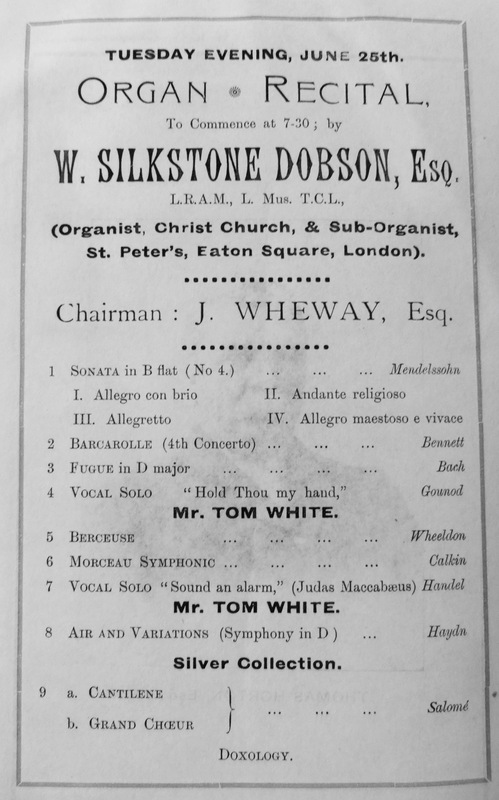 Our total outlay on the premises, including furnishing was £3,000, and after the opening services had been held, we found that from all sources £1,200 had been raised, and we commenced our ordinary work with a debt of £1,800. 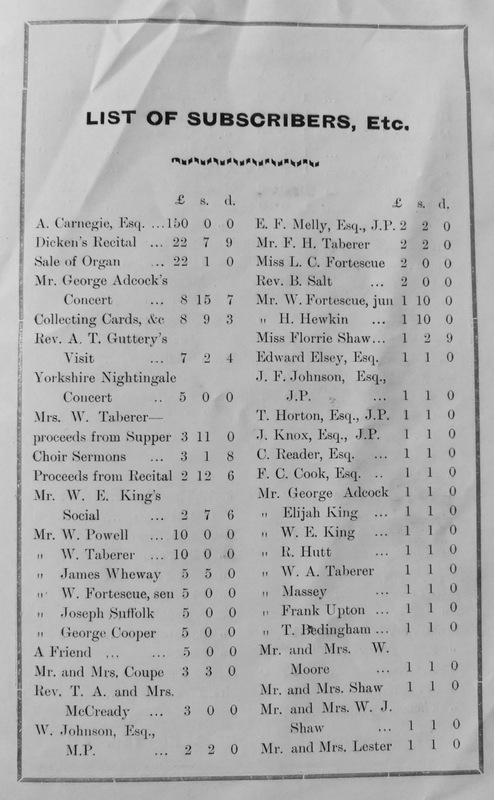 We have paid our way however, and kept nibbling away at the huge debt until in1905 we had reduced it to £1,500. 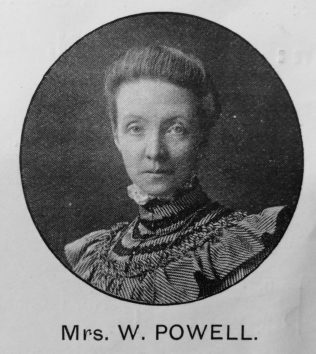 Eighteen months ago, one of our oldest members died – Mrs. Ann Simpson – a saintly lady, who for thirty-three years was a member with us, and whose chief interest in life was the work of God and the prosperity of our Church, and she left to the Trustees her hard earned savings, namely, £300. 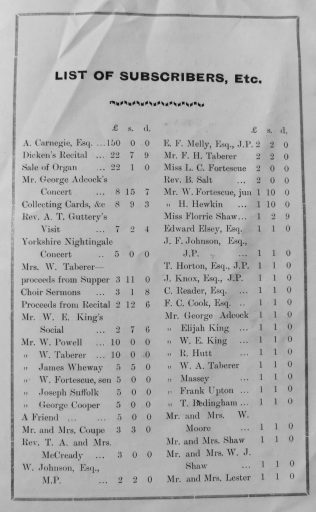 Out of this sum, £200 has been paid off the debt, and the remainder placed in the Bank, so that our debt now stands at £1,200. 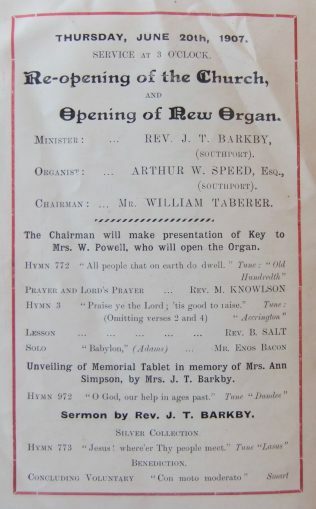 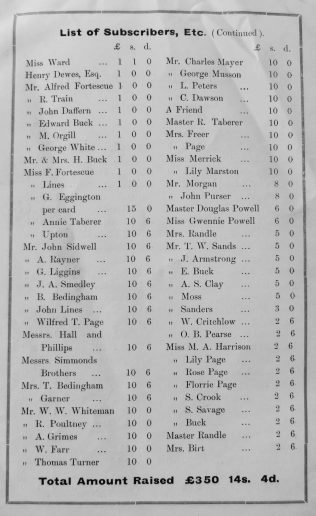 We felt, for some time, that we were sadly in need of a New Organ, as the one we possessed was inadequate, and out of keeping with the size and importance of our Church, so we suggested that our able secretary, Mr. W. Taberer, should write to Andrew Carnegie, Esq., on our behalf, and the letter was signed by our minister and several members of the Church Committee, and before long a reply came, and then an offer that Mr. Carnegie would pay the last half of an Organ to cost £300. 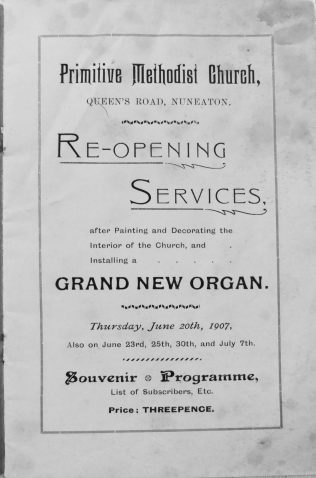 This offer stimulated us, and we determined not only to raise our half of the cost, but also make the necessary alterations and enlargement in the Organ Gallery, and paint and decorate the interior of the Church. We have applied ourselves to this task with holy daring, determined that God’s house shall he made beautiful, and though it means that the sum required has grown from £150 to £260, we are very anxious to raise it, and not add anything to the existing debt. 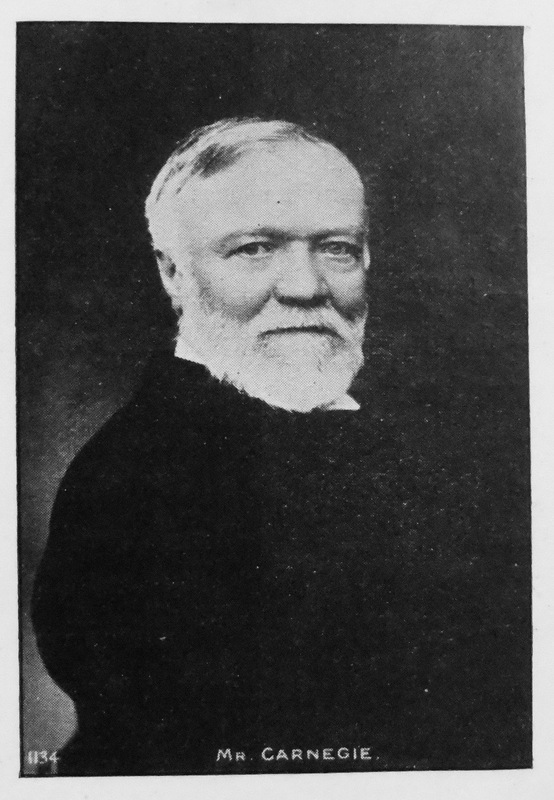 We wish to thank our very generous friend, Mr. Carnegie, and the public of Nuneaton and district, for the way in which they have responded to our appeal, which response has proved that our circle of friends is wider than we ever dreamed or dared to hope, and we say this with a feeling of deep thankfulness to Almighty God. 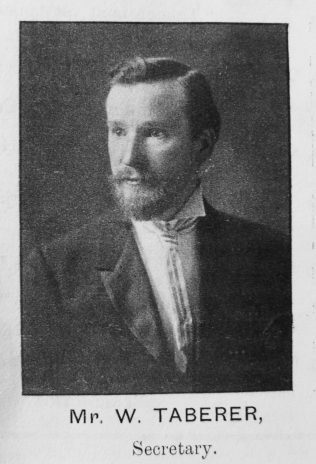 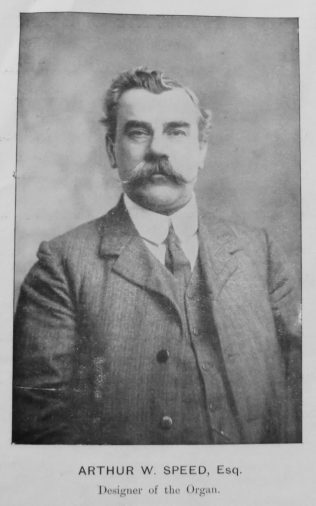 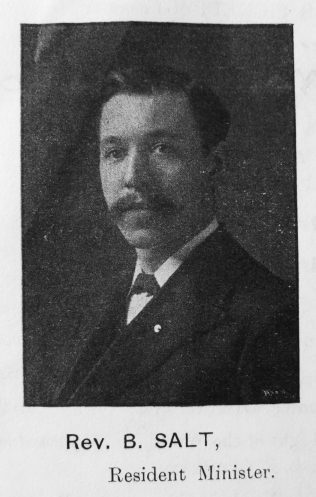 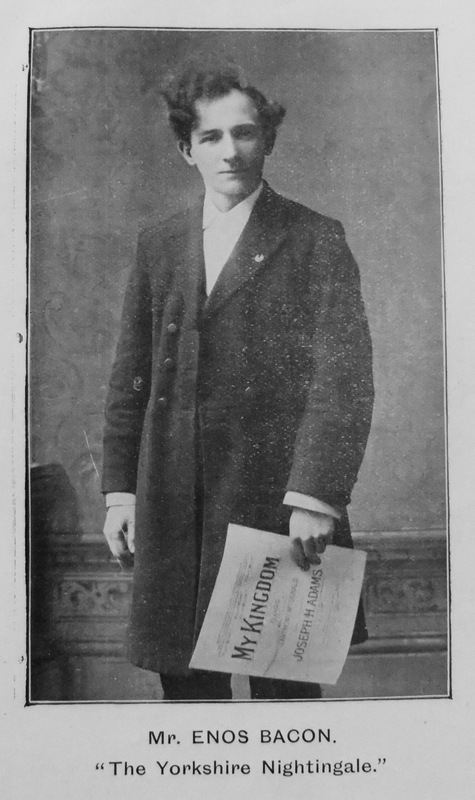 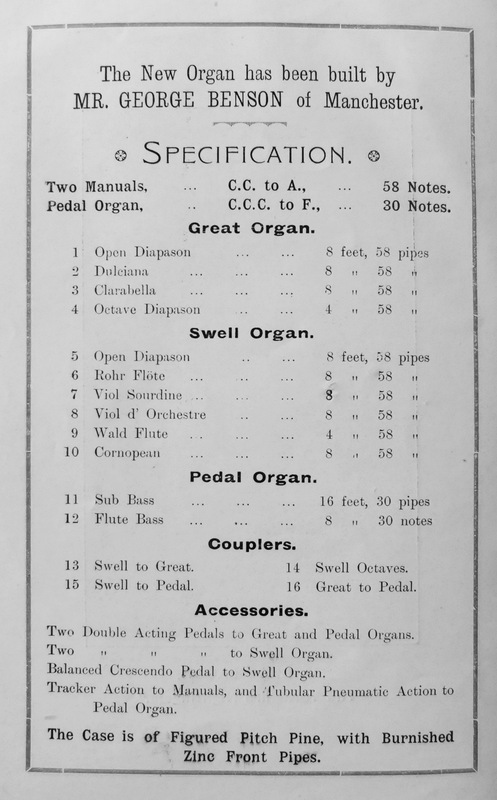 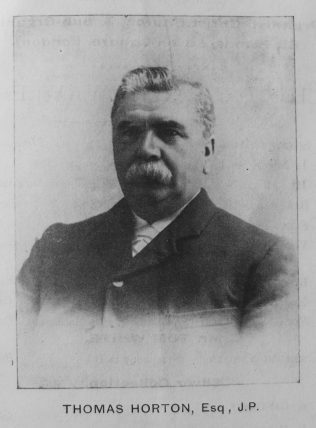 W. Fortescue, jun., Organ Secretary. 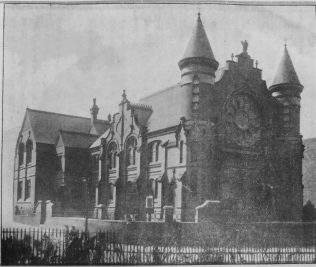 The previous chapel, also on Queen’s Road, was bought in 1841 and in 1859 they added a “neat and substantial gallery … for the accommodation of the Sabbath-school and singers”; the chapel was painted and cleaned at the same time. 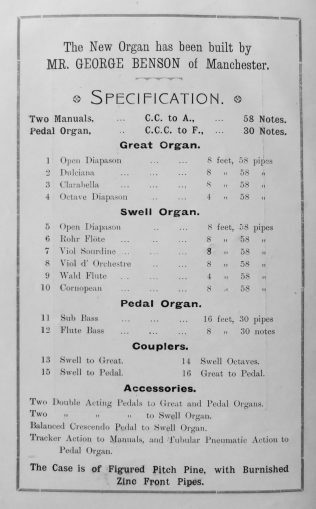 The overall cost was £30. 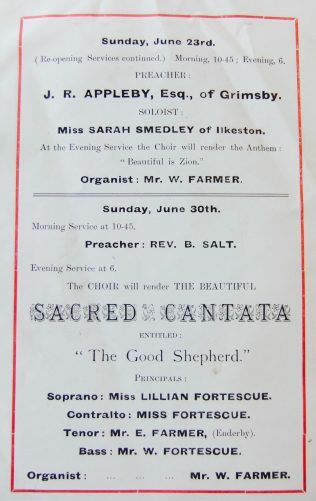 J Shaw who wrote about it in the Primitive Methodist magazine of October 1859 (page 631) declared that the chapel was the “best it had been since our friends bought it in 1841”. 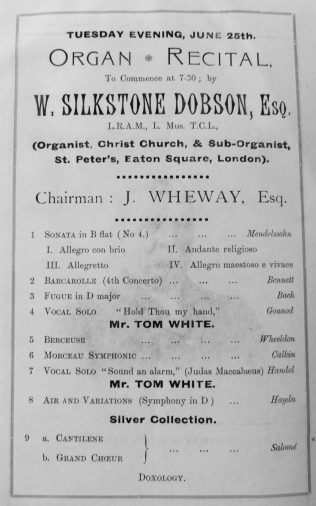 Re-opening services and celebration tea meeting took place on July 31st 1859 when the speakers were J Shaw and Rev Mr Nugent (Independent).